Acai berry is a natural cleanser, helping the liver and kidneys to process and remove waste and toxins from the body. Acai berry is fiber-rich and a natural digestive cleanser, which means it prevents the accumulation of harmful substances and undigested matter from staying lodged in the colon where they can cause constipation and toxic by-products such as ammonia. Acai berry has certain appetite-suppressing abilities thanks to how it effects various hormones that control blood sugar levels and feelings of hunger, fullness, and satiety. It also boosts metabolic function. 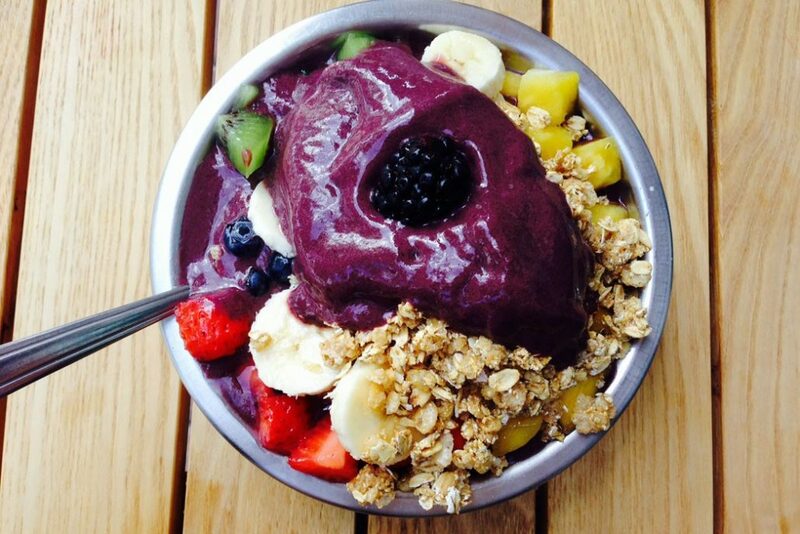 Acai is estimated to have 10 to 30 times the amount of anthocyanins than red wine! Acai may be richer in protective antioxidants than cranberries, raspberries, blackberries, strawberries, blueberries, or goji berries – wow! Acai berries are believed to help stimulate mental function, maintain high energy levels, and deal with various effects of psychological stress better. Acai berry is useful for preventing early signs of aging (wrinkles and fine lines) and helping with skin regeneration. The ellagic acid in acai has anti-proliferative properties due to its ability to directly inhibit DNA binding of certain carcinogens. Acai berries are very rich in beneficial fatty acids like omega 3s. Omega 3s boost brain function and keep our hearts healthy. Blend the acai and milk together in a blender. Then add rest of ingredients. Blend until smooth. Top with desired toppings: cacao nibs, nuts, bee pollen, unsweetened coconut, banana, berries & mango, granola, chia seeds.